Jewelry made in Hawaii is simple, inexpensive and made from natural materials. Here are some types of Hawaiian jewelry. We are all aware of things that we owe to Hawaii – from Hawaiian slippers to the phrase ‘Aloha!’ The mystical land of beauty, both in the surroundings as well as the people, Hawaii is regarded as one of the foremost holiday destinations. What makes it all the more beautiful, is the beautiful jewelry that people make from various materials that are obtained from the sea. They are beautiful and yet inexpensive, with the exception of ornaments made from corals or shark tooth. In fact, once the second largest producer of coral ornaments, many people have stopped selling or making coral jewelry for the fear of hurting the rich ecology of these islands. 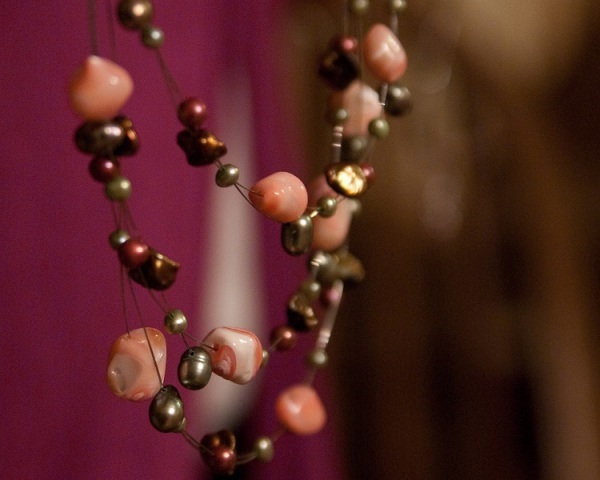 Nevertheless, the people still produce beautiful jewelry made from other materials like fish bones and mother of pearl. Here are some types of Hawaiian jewelry that are commonly sold. Plumeria, also known as Hawaiian lei flower, is the fragrant flower that comes under the orchid family and is synonymous with Hawaii. It is widely used to create beautiful, fragrant necklaces that are often given as a welcome gift to newcomers. These necklaces are presented to all those who visit Hawaii. Though orchids have a very short life and would soon wither away, you could get orchid designs made in shells, silver, or any other material. Also known as Nacre, Mother of Pearl is an iridescent layer of material which forms the shell lining of many mollusks. Pearl oysters and abalone both are sources of mother of pearl, which is widely used as an inlay in jewelry, furniture, and musical instruments. Mother of pearl comes in several natural colors, and is often bleached and dyed for decorative use. Mother of pearl jewelry is extremely common in Hawaii. Just like ivory tusks, fish bones can also be carved, polished, and turned into jewelry. The bones can be shaped into fishhooks, or a variety of other flora and fauna that is commonly associated with this island. Once a piece is shaped, it is given a high polish and strung, sometimes combined with puka shells, or coconut beads. Beginning their lives as Conus shells, Puka shells get washed to the shore, where they keep hitting against the rock repeatedly, until they are ground down and polished. Eventually only the tops of the shells remain, which are then strung together to make necklaces, and other pieces of jewelry like bracelets and anklets, that are so widely appreciated. Once a very popular choice for jewelry, these calcified skeletons of sea creatures that grow out in branches just like a tree, have been banned from being used to make jewelry. The destruction of coral reef has been linked to the ever-looming crisis known as global warming. Since Hawaii boasts of a rich ecology, which is the lifeline of three quarters of its population, people have stopped making and selling coral jewelry. Shark tooth has long been used to make jewelry. Hawaiian people consider the shark to be the guardian spirit of the ocean and regard it as a protector and savior. Wearing its tooth in jewelry is considered as capable of bestowing the shark’s power on the wearer. Many necklaces use a single shark tooth as a pendant, and necklaces using multiple teeth are believed to bestow power as well as protect the wearer. Cowries that were used as currency centuries ago in some African nations, are an excellent option for making traditional Hawaiian jewelry. Cowry shells actually come from snails, and are in demand for their glossy exteriors and also for the various colours they are available in. The Golden Cowries, a very rare variety, was once reserved for only Hawaiian royalty to wear.